Voyage en Islande et au Groënland exécuté pendant les années 1835 et 1836 sur la corvette La Recherche commandée par M.Tréhouart Lieutenant de Vaisseau dans le but de découvrir les traces de La Lilloise. Paris: Arthus Bertrand, 1838-1852. 11 volumes in 16 (Text: 7 volumes in 13, 8° [250 x 162mm. ]; atlas: 3 volumes in 2, 2° [542 x 352mm.] and 1 volume, 8° [247 x 167mm]). Text: lithographic portrait on india paper mounted, 3 plates (2 folding), folding engraved map, 2 folding letterpress tables, 10 engraved graphs; atlas (2° format): 3 lithographic title vignettes, tinted lithographic additional title, 200 plates (25 coloured, 157 on india paper mounted); atlas (8° format): 36 aquatint plates. (Some browning and spotting, particularly to mounts of plates in india paper.) Text: original paper-covered boards (some soiling and bumping, occasional small tears to backstrips); atlas (large format): contemporary French green morocco-backed marbled boards, spines gilt (light bumping and scuffing to extremities); atlas (8° format): contemporary blue calf-backed marbled boards (extremities rubbed, small splits to joints). A fine, rare and complete set of this fascinating 'grand voyage', with detailed results on Iceland, and some interesting information on the seas to the north and west of Iceland and the Greenland coast. 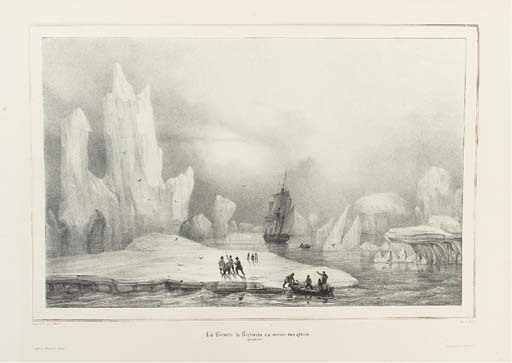 The voyage was carried out by the corvette La Recherche in 1835 and 1836, under the command of Lieutenant Tréhouart. The primary mission was to establish conclusively what had happened to the brig La Lilloise, which had not been heard of since August 1833. In addition they were to survey and record the life and scenery of Iceland and the east coast of Greenland. Victor Lottin. ...Physique. Paris: 1838. 1 vol. in two. Half-title. 10 engraved graphs. (First vol. browned). Eugène Robert. ...Minéralogie et Géologie. Paris: 1840. 2 vols. in three (text: 1 vol. in two; atlas [8° format]: 1 vol.). Text: half-title, 4pp. publisher's adverts. at back of second volume. Numerous wood-engraved illustrations. (Some light spotting). Atlas: 36 aquatint plates. (Two plates almost detached). Xavier Marmier. ...Littérature Islandaise. Paris: 1843. 1 vol.in two. Half-title. Eugène Mequet. ...Journal du voyage. Paris: 1852. Half-title, 2pp. errata at back. Folding engraved map, 2 folding lithographic plates.